Hi everyone! Lucy here! 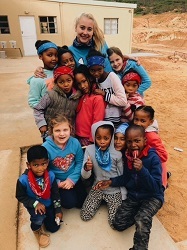 Today was the second day of the Citrusdal youth camp! We had about 190 children attending, and it was super fun! We sang worship songs, made bracelets, and played games! Each day only gets more fun as we start bonding with the children. Something that was really funny was the first day we were there we were all doing coloring sheets, I was sitting with a crowd of young girls. Whenever I would color something, they would all look at my sheet and copy exactly what I was doing. I ended up with about five exact replicas of my coloring page. We are all having a blast, and can't wait to share more stories!